The Macuá is a cocktail made with white rum and fruit juices, usually lemon and guava juice. The Macuá is noted as the national drink of Nicaragua. The drink is named after a tropical bird native to the country. Left: Frozen Macuá made with Flor de Caña extra dry brand. The Macuá was invented by Dr Edmundo Miranda Saenz, a pediatrician from Granada, a small and historic city on the shores of Lake Nicaragua. Miranda enlisted the help of his immediate family, including his wife, daughter and son-in-law, to perfect the recipe. The drink rose to fame in October 2006, when it was entered in a competition to choose a national drink of Nicaragua. 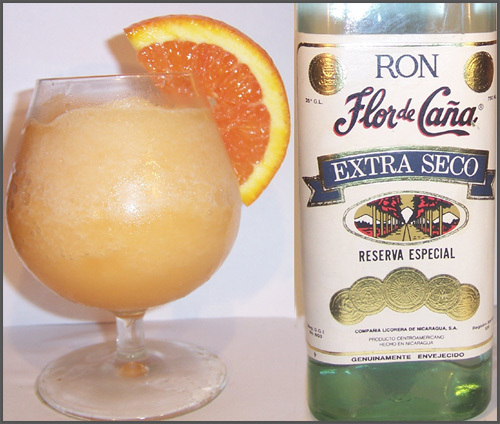 The competition, sponsored by Flor de Caña, a Nicaraguan rum manufacturer, involved more than twenty different drinks based on the company's products. The judges, including the French ambassador and a cocktail connoisseur from a Swedish development agency, chose the Macuá over other combinations of local ingredients including pineapple, tamarind and even coffee beans. Served: in a highball glass, on the rocks, garnished with an orange or lemon slice.